While we love to share and celebrate with our pets during the holidays, it’s important to remember that certain foods that are good for us can actually be dangerous to our pets. However, if you know what you can and cannot feed your pet, certain Thanksgiving foods can be healthy for your pets in small quantities. Just remember that abrupt changes in diet can cause an upset stomach. Be sure to keep an eye on your pet and make sure that they don’t over-indulge. Turkey – In small amounts, turkey can be OK. Just be sure that the meat is lean, light meat that is bone-free. Dark meat is too greasy for your pets and bones can get lodged in their GI track. Mashed Potatoes – Plain mashed potatoes (with minimal fat and salt) can be OK for your pet. However, potatoes with butter and heavy cream can be too fattening for your pets. Fatty foods can upset their stomach and even be life threatening. Green Beans – Plain, unsalted green beans can be a nutritious holiday treat for your pets. However, avoid offering your pets green beans that are mixed with other ingredients (i.e. avoid green been casseroles). Loose Corn – If you are serving unbuttered corn, this can be a healthy treat for your dog. However, avoid corn on the cob. Small pieces can cause an obstruction in your dog’s digestive system. Pumpkin – Pumpkin can actually have several health benefits for your pets. If you can find unsweetened, natural pumpkin, this can be a great holiday treat for your pet. Just be sure to avoid pumpkin pie fillings, as they are often high in sugar. Turkey Gravy – Gravy is often made from stock, pepper and seasoning. While it may be a delicious addition to your Thanksgiving turkey, it is too fatty for your pets. 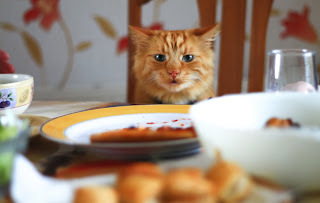 Stuffing – Stuffing is often full of fat, butter and ingredients (like onions and garlic) that are very harmful to pets. As a general rule of thumb, it’s best not to offer your pets stuffing. Candied Yams – Sweet and buttery yams are too sugary and fattening for pets. Chocolate – Chocolate can cause high heart rates in dogs, among other problems. Avoid feeding your pet anything your are baking with chocolate. Alcohol – It may seem obvious, but you should keep alcohol out of reach of your pets. Even small amounts of alcohol can be dangerous. If you have any questions about your pet’s odd behaviors, contact our office for more information at (866) 588-4200.